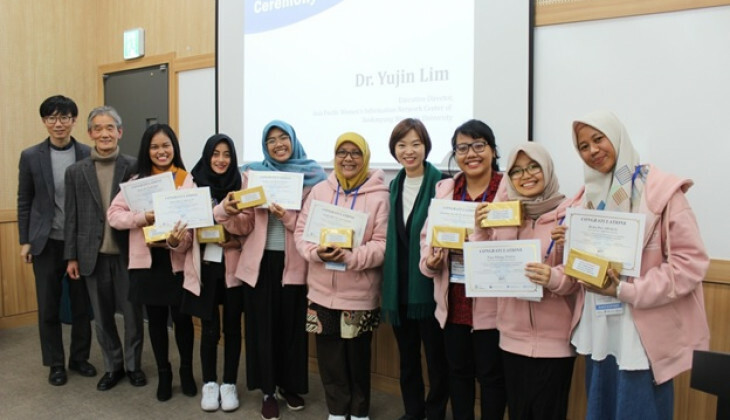 UGM students delegation joining Kartini Gama team has won the first place award in the 2018 UNESCO-UNITWIN ICT & Leadership Advanced Workshop and International Competition event that ran from 10-15 December 2018 in Sookmyung Women’s University, South Korea. The 7-member team from various faculties was divided into ICT and leadership team. The ICT team comprised Teya Titiang Tiana, Christina Dwi Kusumaningtyas, and Rizka Dwi Amalia while leadership team Anisa Dian Larasati, Hanin Banurukmi, Nurisa Fajri Wijayanti, and Linda Oktavianingsih. Teya said the competition was run by Sookmyung Women’s University and Asia Pacific Women’s Information Network Center (APWINC) UNESCO-UNITWIN program in cooperation with UGM Centre for Women’s Studies. It was funded by South Korea’s Education Ministry. “The competition was joined by 39 people who had been selected from Universitas Gadjah Mada, Life University, Royal University of Phnom Penh, National University of Laos, and Souphanouvong University,” she said in a release sent on Monday (7/1). Apart from the competition, the participants were given training by experts in ICT and leadership. The ICT team was given training in Arduino and Raspberry Pi by Prof. Todd Holoubek from Seoul Innovation Center. The leadership team was given Female Leadership, Personality Type Test and Career Mapping and Design Thinking training by Dr. Myonghee Kim, Dr. Swookyung Suh, and Dr. Yeunkeum Chang. In addition, all participants were given a special lecture themed Believe in Your Potentials by Dr. Hyungjin Lee and Entrepreneurship for Future Talent by Miran Kim (APEC Best Award Grand-Prix Winner). Besides, they had the opportunity to visit Amazon office in Korea, learn Korean culture and hands-on practices in making traditional bracelets in Korea Style Hub, and enjoy musical show at NH Art Hall. At the end of the event, the participants were asked to share ideas on women’s empowerment for government, school, family, individual, and community levels using ICT. “The UGM team has become the best winner for the idea of protection of female workers,” she said. Teya explained her team developed technology prototype innovation named as HER (Helper Bracelet for Migrant Worker) that was installed with ARDUINO KIT. It was designed to help the migrant workers in domestic sector who are vulnerable to abuse and harassment. “The development of the prototype was inspired by the rampant fatalities and injustices inflicting Indonesian migrant workers working abroad,” she said. They hope the idea and design could be developed further to improve empowerment in developing countries to be in line with Sustainable Development Goals point 5 on Gender Equality and point 8 on Decent Work and Economic Growth.